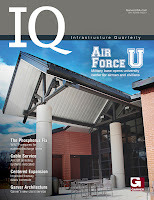 A military base that has opened a university center for airmen and civilians. The Little Rock Air Force Base and City of Jacksonville, Arkansas constructed a joint-university center that provides 30 classrooms for 800 college-level students. It is recognized as the first education facility built through a community and U.S. Air Force partnership. A project to relocate an airport runway's aircraft arresting system, which is used in emergency situations to stop malfunctioning fighter jets. In operation for more than 30 years, Tulsa International Airport in Oklahoma updated its aircraft arresting system to the latest U.S. Air Force site criteria. This included a new steel cable that crosses Runway 8/26 to snag an F-16 Fighting Falcon's tailhook. A freeway project that paved inside the grass median to ease commuter traffic. More than 65,000 vehicles use U.S. 169 every day, and transportation officials initiated improvements to increase capacity and provide a safer artery between Tulsa and Owasso, Oklahoma. The project widened the urban freeway from four to six lanes and involved cost-effective design methods, a unique drainage profile, and special bridge features. A wastewater treatment plant that is prepared to meet unprecedented effluent phosphorus limits targeted for 2012. By implementing the first phase of an enhanced nutrient removal program at its plant on Sager Creek, the City of Siloam Springs, Arkansas is well on its way to meeting anticipated phosphorus discharge limits. Garver's newest service: architecture. Garver has received its corporate certificate of authority to provide architectural services in several states. Watch your mailboxes for this issue or read past editions on our website.